Imagine all of the boyish fun that comes along with having triplet boys! Turning one meant three times the fun when parents Anna and Frank celebrated their darling boys with a little lumberjack 1st birthday party! Get loads of inspiration with these 24 first birthday party themes and ideas. Like lemonade? This lemonade stand 1st birthday party is a unique theme for a milestone celebration. Thankfully, they had great help from Bruna Sanches of Simply Lace Photography and Kathie Barone of Southern Charm Vintage Rentals, who styled an incredible rustic-meets-burly affair. Handsome details like wood and flannel paired perfectly with outdoorsy themed props and absolutely stunning paper, hand lettering and chalk art décor. The three boys named Joseph, Anthony and Christopher – whose parents lovingly refer to as “JAC” collectively – provided the perfect inspiration for a lumberjack theme. Their loving aunt Kathie (Southern Charm Vintage Rentals) arranged for an incredible day of birthday fun. Guests were greeted with a white farm table displaying “Lumber Lager” and an antique box full of thoughtful pine tree party favors. I love the chalk art sign accompanying the favors that invited guests to take a tree and “grow with us”. The favors couldn’t have been more perfect, wrapped in burlap and accented with a mini “I heart lumberjacks” button. Mini mason jars were outfitted in flannel and twigs and couldn’t have looked more appropriate for the theme. Other inspired welcome table details included buffalo check party hats and lumberjack photo booth props creatively displayed in plaid thermos bottle vases. I love the rustic “1” cut from wood; a vintage-looking saw rests nearby, as if the log camp boss had just finished the piece. An impressive dessert table was styled with pinecone bunting and a large, 3-dimensional cardboard moose head overlooking the treats below. Love the jaunty hat on the moose – what a party animal! Wooden crates and wood cake stands provided a wonderful display for the treats. Beautiful hand-painted cookies (lanterns, pancakes, flannel shirts and tools!) were provided by The Cocoa Cakery. The detail work is phenomenal. The Cocoa Cakery was also responsible for three matching smash cakes, created to look like logs with edible bark-like detailing. Doris Wai created the intricate hand-cut banner style toppers. Notice how each boy’s name is held by song birds. Additional “burly baked goods” included caramel corn, aptly named “Jack’s snacks”. Note the clever axe shaped food labels, in mini tree trunks – don’t you love the thought that went into this table? Mason jars hand-lettered with “Apple Ale” served the brawny beverages. They were accessorized with wood grain straws and plaid flag detailing. Despite the darling décor and desserts, the true stars of the show were the little lumberjacks themselves. Photographed in a vintage red wagon with darling hand-illustrated paper axes and the cutest wood sign by Doris with the phrase, “Axing for trouble”, the boys couldn’t have been more adorable! The family dog, Grimsby, was dressed up in his best birthday plaid for the occasion. Can you imagine a more charming smash cake session? And seriously – how cute is that baby bathtub for post cake clean-up? 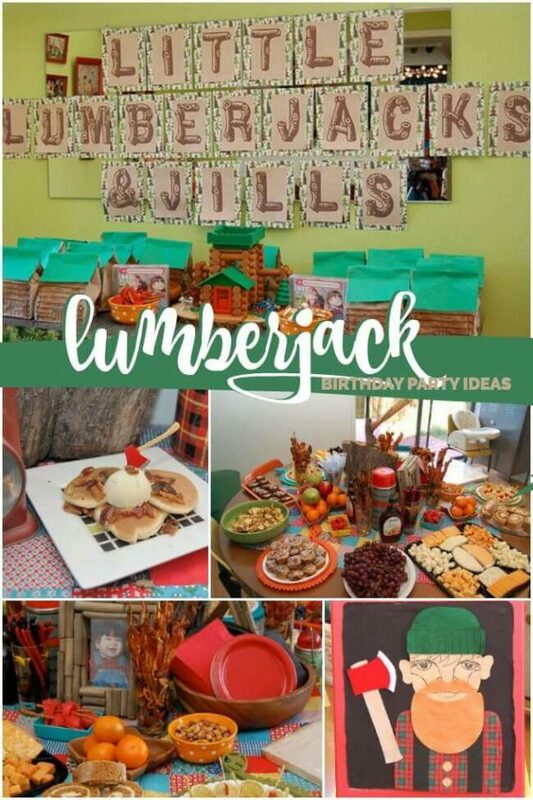 Someone might as well yell “timber” because I think I’ve fallen in love with this sweet lumberjack 1st birthday party theme and those cute little boys! What an awesome celebration!